Support diagnosis tools including: Ping, DNS Lookup, Trace Route, Port Scanner, Whois, Server Monitor and LAN Scan. Support the Server List for frequently used servers. Support Recent Tasks for recent executed tasks. 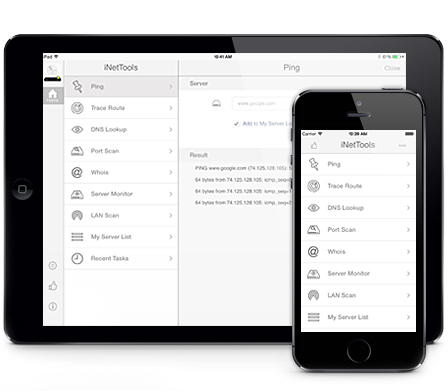 With its simple interfaces, iNetTools provides the easiest way to diagnose your network problems on iPhone and iPad.